We all remember moving out of our childhood home. For many of us, it was both a thrilling and absolutely terrifying experience. But possibly, one of the most fulfilling feelings is turning a house into a home—and a family home becomes the hot spot where so many memories are made. So how do you cope when your once happy home is filled with heartbreak? 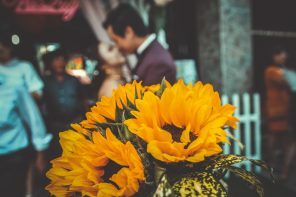 Over 90 percent of people in Western cultures will get married by the time they turn 50, according to the American Psychological Association (APA), but almost half of these marriages will end in divorce. We asked 501 people in the U.S., from ages 22 to 77, how they dealt with their divorce, who kept the marital home, and how they transitioned into a new chapter of life. Keep reading to see how divorced respondents are attempting to pick up the pieces and create happy, healthy homes. 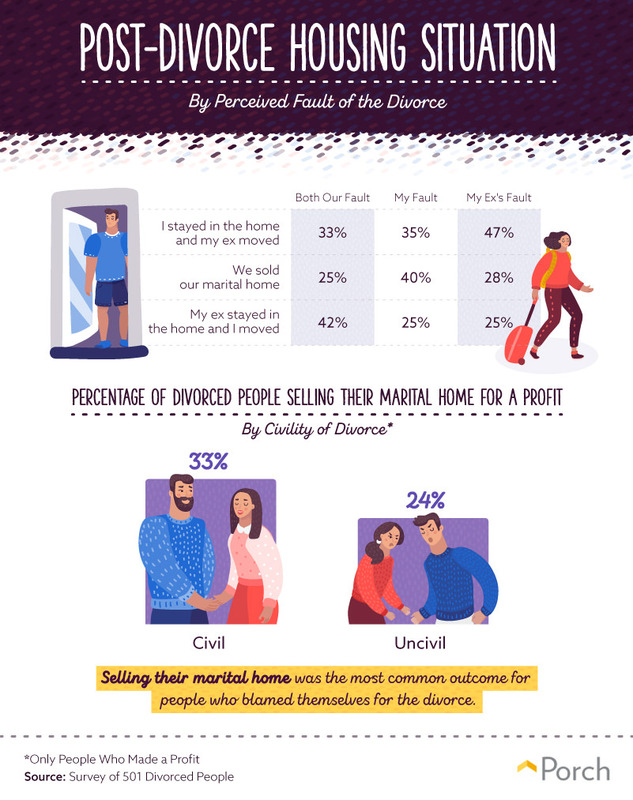 According to our survey, the decision to sell or stay in the marital home was influenced by a feeling of responsibility for the divorce. Almost half of those who felt their ex-partner was mainly at fault for their divorce ended up staying in the family home. 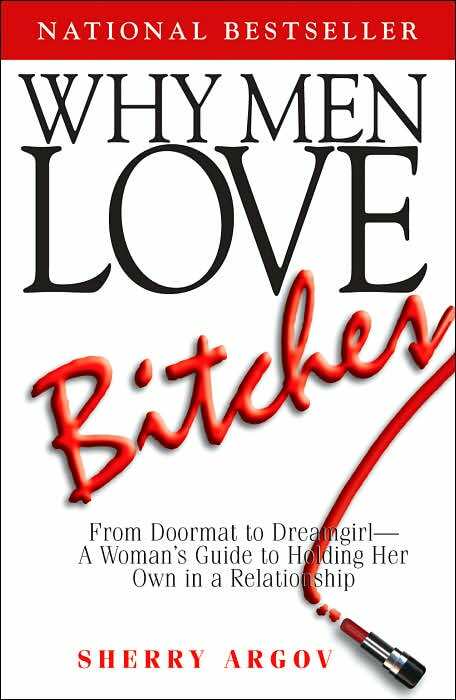 Whereas, selling the home was the ideal outcome for people who blamed themselves for the divorce. When faced with a fresh start post-divorce, more people decided to stay in the same city instead of moving away.Twenty-seven percent said they remained in the same city because they had well-established roots. Others said they didn’t want to move too far away because they wanted to stay near their job (23 percent), family (19 percent), or kids (18 percent). 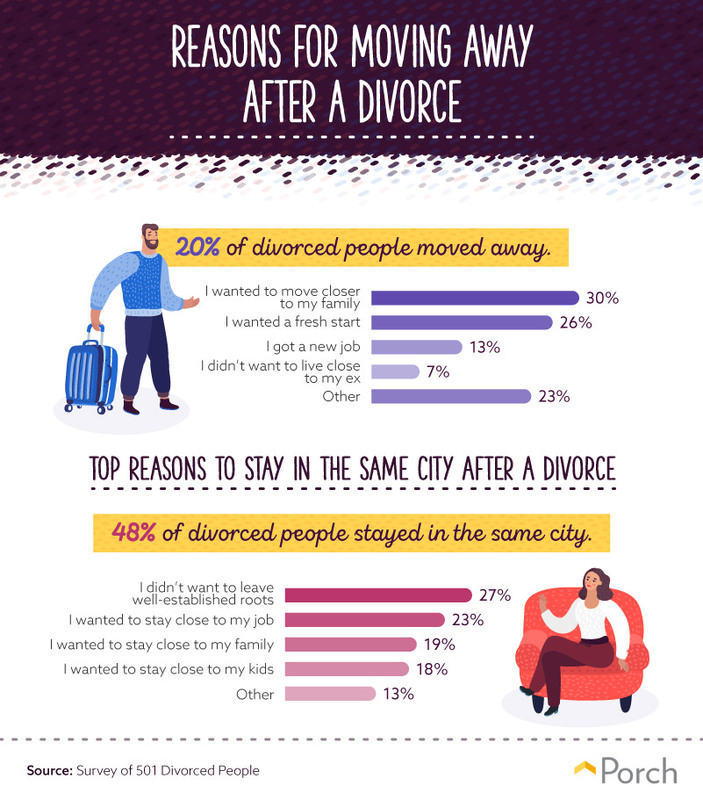 Of the 20 percent who moved to a different city or state after a divorce, 30 percent wanted to be near their family. According to the Mayo Clinic, having a strong social support network of friends, family, and peers can be a crucial part of one’s emotional and individual health during periods of high stress or emotional angst. Sometimes, couples postponed splitting up, especially when kids were involved. Sixty-four percent of divorced parents said they stayed married longer than they wanted to because of their children. The greatest number of parents (42 percent) said they remained in the relationship an extra one to three years. 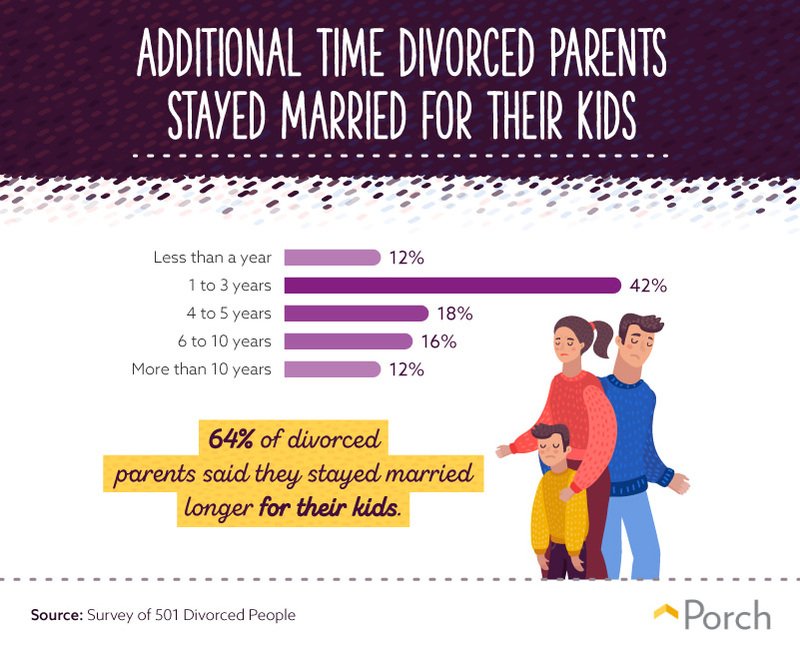 Twelve percent of divorced parents said they even stayed together for more than 10 years longer before filing for divorce. Only 12 percent of parents divorced rather quickly, staying married less than a year longer. The welfare of children may drive couples to stay together, but sometimes it can be harder on the child. According to the APA,children can experience more problems when parents remain in high-conflict marriages instead of splitting up. Most children adjust well to their parents’ divorce within the first two years. Our survey participants concurred, with a majority of parents (75 percent) reporting their children handled the divorce fairly well. Of those parents, 37 percent said they felt they did a good job keeping conflict away from their kids, and 33 percent said they talked to them about their feelings more often during the split. 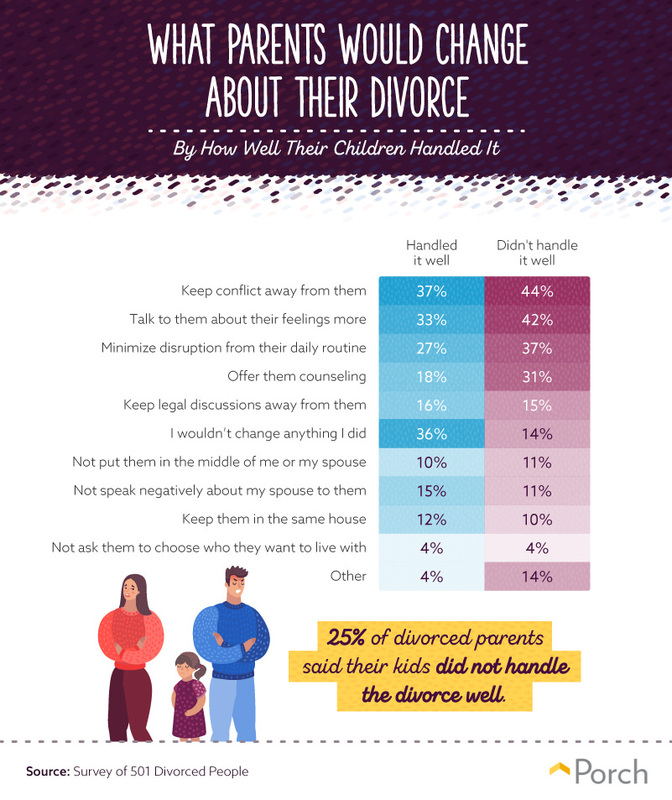 Twenty-five percent of parents said their children did not handle the divorce well, and 44 percent of these parents said they wished they had done a better job at keeping the conflict with their spouse away from their kids. 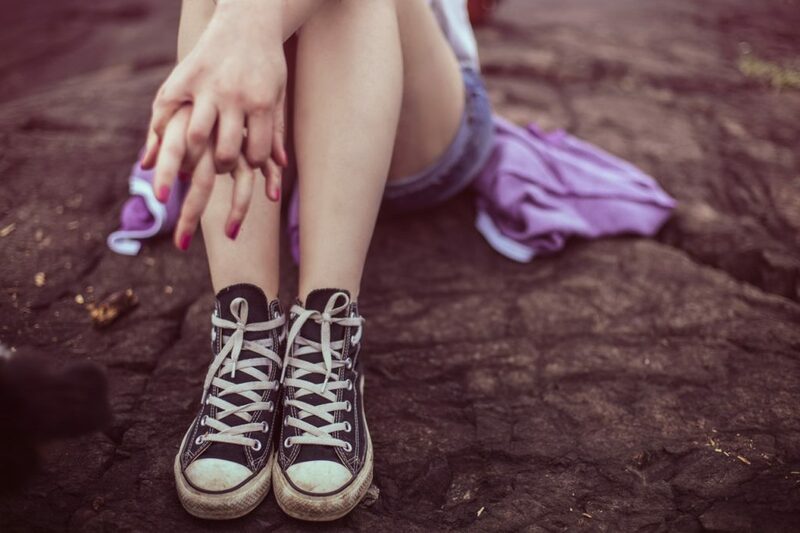 Forty-two percent of these parents said they wished they had talked to their kids about their feelings more often. 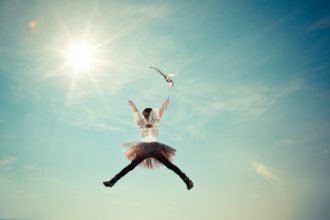 According to the American Academy of Child and Adolescent Psychiatry, it is easy for a child to become confused, take the blame, or misinterpret the divorce unless his or her parents say what is happening. Being as straightforward as possible with your children, as well as having frequent discussions with them about their feelings can make a difference in the time it takes for them to transition and adapt to such a change. Thirty-six percent of parents of children who handled the divorce well said they wouldn’t change anything about how they personally handled the split, compared to only 14 percent of parents who said their children did not handle it well. In a study aimed to identify the underlying causes of divorce in the U.S., 75 percent of individuals listed a lack of commitment as the reason for their breakup, according to an article published by the National Center for Biotechnology Information. 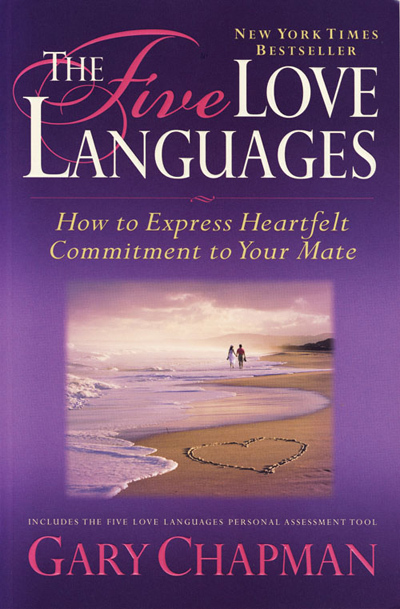 According to the article, commitment and communication overlap and often go hand in hand within a marriage. 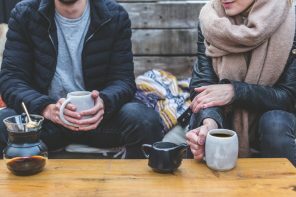 Similarly, our survey showed that a lack of communication was the top culprit of divorce, with 61 percent of men and 53 percent of women citing this as the reason for their breakup. Constant arguing and being cheated on were two other top reasons, whereas cheating on a spouse and a lack of individual identity were two of the least cited reasons for getting a divorce. 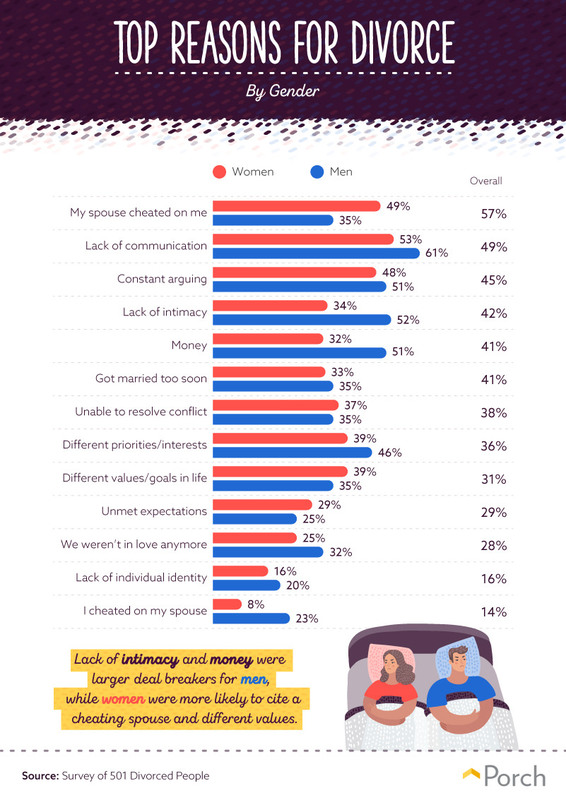 A lack of intimacy and money were much bigger deals to men, whereas women cited a cheating spouse and differing values much more frequently than men. What do your generation and gender say about your divorce? 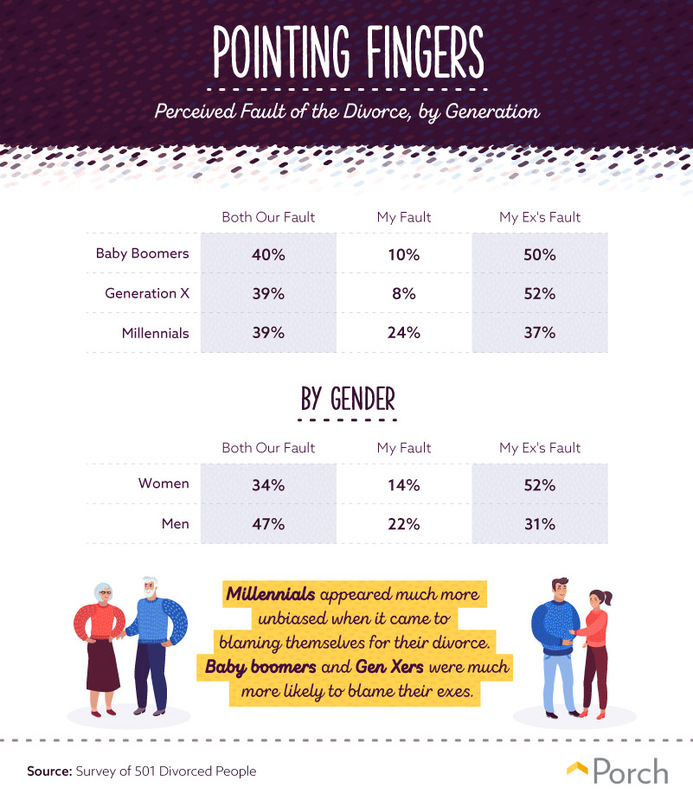 According to our survey participants, baby boomers and Gen Xers were more likely to blame their partner for the divorce, with Gen Xers being the least likely (8 percent) to shoulder any of the blame. Millennials appeared much more unbiased when it came to blaming themselves for their divorce, however. According to the World Economic Forum, millennials have less than a 50 percent chance of divorce. Unlike baby boomers who often married at younger ages, millennials (and some Gen Xers) are waiting to marry once they have completed their education and have stable careers and finances. The increased popularity of cohabiting before marriage has also likely caused a dip in divorce rates. Life is full of transitions—some are exciting and fun, while others may seem like the hardest moments of your life. Despite whatever transition you may be facing, finding a place that brings you comfort is priceless. 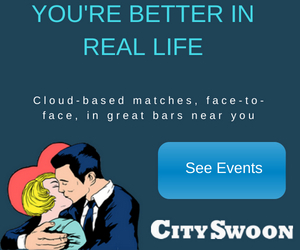 Next articleDo you really need the wedding everyone else has?